Riddim Runway Reggae Festival, SWFL hottest fashion and music festival, will sell 99 tickets today only (09/09/09) for just $9 each. You can get these special discounted tickets by contacting King Leo Promotions directly at 239-462-4044. These tickets will be sold on a first come, first serve basis. 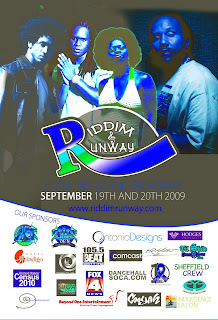 For more information regarding Riddim Runway Reggae Festival go to http://www.riddimrunway.com/. Please forward!!! Thank you for your support.